When I went to Hawaii a billion years ago, ok not that long ago, but it seems like forever. I figured out what the expensive part of the trip was. It wasn't the flight or the hotel or even the activities for the day, it was the food. Seriously! We ate our first dinner at the Hard Rock Cafe in Honolulu and the bill for just myself was about $35. Yikes!! My friend and I discovered a Denny's right around the corner from our hotel and we averaged about $10 a meal. Much more affordable, and thus my love of Denny's was born. There are so many great things to eat there, from the pancake bites to the omelette's. 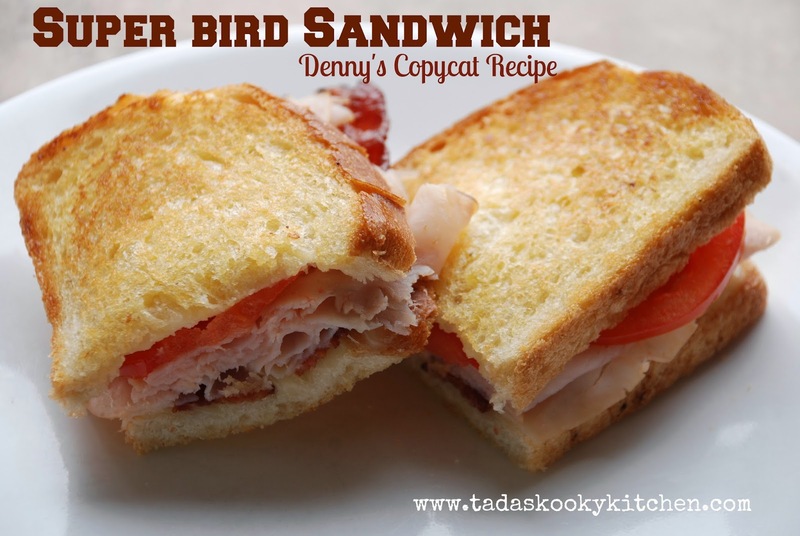 But my favorite sandwich is the Super Bird. I order this about 95% of the time. Then I figured out that I wanted to make it at home. It's become a weekly thing for me now. I hope you all enjoy! Butter one side of 2 slices of bread. Slice tomatoes. Cook bacon (the best way is in the oven so they lay flat). Then warm up either a frying pan or electric skillet to a medium heat. You are going to make these the same way you would make a grilled cheese sandwich. Lay one piece of bread, butter side down on warm skillet. Then layer Swiss cheese, bacon, turkey, and tomato. Then you put your second piece of bread on top, butter side up. Cook on a medium heat till bread is toasted and a light golden brown. Carefully flip your sandwich over and cook the other side. Serve warm. If you want to add mayonnaise or miracle whip you can, but I think the sandwich has enough flavor all on it's own.